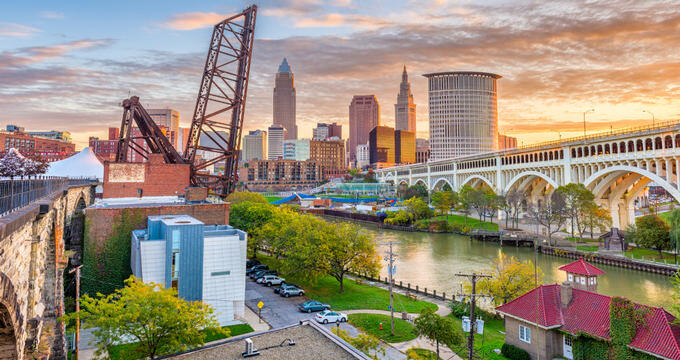 Cleveland welcomes families with open arms and offers a long list of fun and educational attractions for children and their parents. You will find several interesting museums, libraries and other cultural attractions that children will love, including the Cleveland Museum of Natural History, the Children’s Museum, the Cleveland Museum of Art – all of which offer special children’s workshops and events. The Cleveland Museum of Natural History is sure to please not only the children in your family but all the adults too. The museum offers several engaging educational activities for children of all ages and you should be sure to visit their website ahead of your visit to find out what to expect and how to get the most out of your visit. Besides a wealth of interesting exhibits which you can tour at your own pace, the museum offers a regular series of special immersive programs for toddles, pre-schoolers and older children. 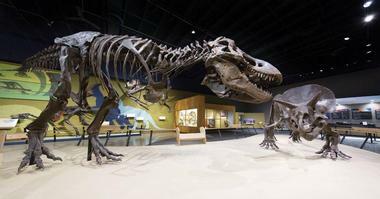 One of the highlights of your visit will undoubtedly be the brilliant dinosaur exhibition. Visiting the Children’s Museum of Cleveland is a sure-fire way to excite and entertain children of all ages, including children with special needs. The museum has recently moved to larger premises and can now offer several extra playing and learning areas together with an outdoor space where you are encouraged to stop and enjoy a BYO picnic. Highlights of the museum include Adventure City, (where children can climb, build, work and explore while learning about daily life) and the fascinating Wonder Lab where children can have hours of fun at two water tables. Children are encouraged to express their artistic talents at the Arts and Parts laboratory and the Making Miniatures exhibit. You can awaken a love of theatre and live performance in your children by introducing them to the Children’s Theatre at Playhouse Square at an early age. An inexpensive season ticket will give you four opportunities to take the children to see entertaining and age-appropriate productions each year. If you child shows more than a passing interest in the shows you can expand their experience by enrolling them in a forty-five minute creative workshop led by a professional teaching artist. 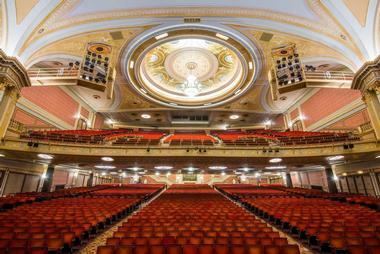 Workshops are available for each of the four shows presented at Playhouse Square each year. Playhouse Square has an on-site parking garage and is also easily accessible via the E-Line and C-Line RTA Downtown Trolley service. 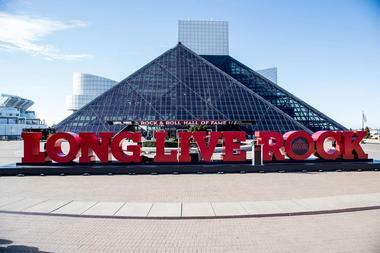 Cleveland’s impressive Rock Hall offers great entertainment for music-loving families and is definitely worthy of a place on your Cleveland itinerary. 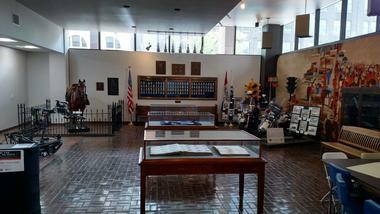 The Rock Hall boasts six exciting levels with lively exhibits to entertain the entire family. You can take a peek behind the scenes at the Backstage exhibit, see thousands of pieces of rock ‘n roll memorabilia including musical instruments which were used by your music heroes, stage props, costumes and much more. Be sure to catch the Power of Rock Theater Experience before moving on to see the British Invasion exhibit which celebrates the Beatles and other artists of the swinging 60’s. Not everything is about vintage music artists - the Right Here Right Now exhibit explores how modern bands are changing the history of Rock ‘n Roll. Children of all ages will enjoy a visit to the Greater Cleveland Aquarium where they can immerse themselves in the colorful underwater world which is showcased in over fifty exhibits spread over eight galleries. Most of the younger children will tell you that their favorite exhibit is the Touch Pool in the Coastal Boardwalk gallery where they can come face to face and even touch the sting rays. 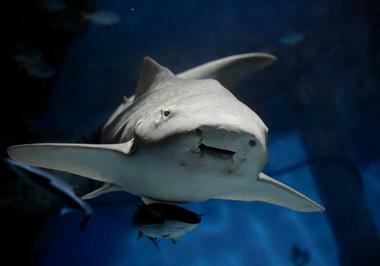 Older children tend to regard the underwater Sea Tube, where they can be surrounded by sharks and dozens of other sea creatures to be the highlight of their visit. As you move through the aquarium you children will learn about important ecological concerns such as pollution and climate change. 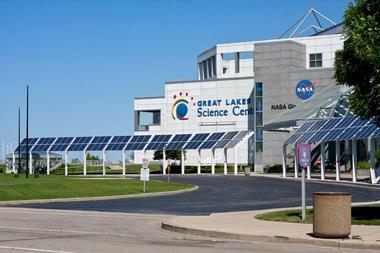 The Great Lakes Science Center effortlessly combines fun and learning for the whole family. The center has hundreds of hands-on exhibits for children to explore including many which are suitable for really young visitors. A few of the most exciting exhibits include the new Grossology exhibit where children can learn all about our (sometimes) embarrassing bodies. The Cleveland Clinic Dome Theater is one of the most popular exhibits at the center, featuring a giant dome screen which surrounds you with amazing sounds and images of some of the world’s most extraordinary natural wonders. The center hosts Early Childhood Workshops for children less than seven years of age and daily Science Demos for all ages. 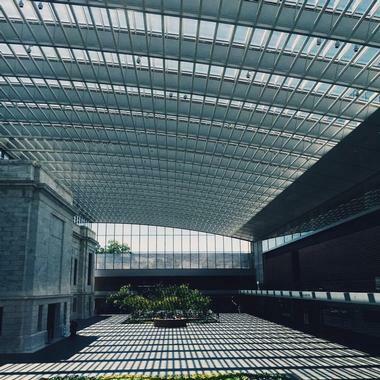 The Cleveland Museum of Art is definitely not an adults-only city attraction – families will find that the museum has a great deal to offer children of all ages. Starting with the very youngest of visitors, the museum invites toddlers (under 18 months) and their parents to enjoy a Stroller Tour every second and third Wednesday of the month. Slightly older children are invited to come and read, look and play at the Saturday morning Art Story workshops and then there are regular studio art classes for various age groups. On Sundays you can bring your children along to enjoy some hands-on creativity in the Make Space. For a welcome change from visiting museums and workshops you can head for the great outdoors and take the children to spend a day in the Cuyahoga Valley National Park. If you are traveling with older children you can all hire bikes and enjoy a ride along the beautiful Towpath Trail which runs all the way through the park. The trail is also perfect for hikers who can enjoy excellent bird watching along the way. Younger children will probably prefer a ride on the vintage Cuyahoga Valley Scenic Railroad which runs between Independence and Akron on Saturdays and Sundays, offering great views of the park and the chance to visit scenic Peninsula. 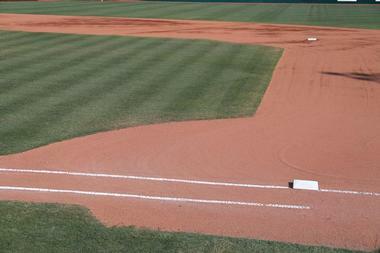 Watching the Cleveland Indians in action at their Progressive Field baseball park is a great option for a family outing. Parents who are attending with younger children can use the Family Deck which is a great indoor/outdoor area which boasts a parent’s lounge area, family-friendly concessions and the Kids Clubhouse which is filled with fun interactive play areas where younger children can be entertained. There are great ride-on toys for toddlers and 3D player cutouts where children can have their photo taken. Older children can hone their baseball skills with the interactive Hot Corner video game and have fun with the interactive Locker Room exploration area. 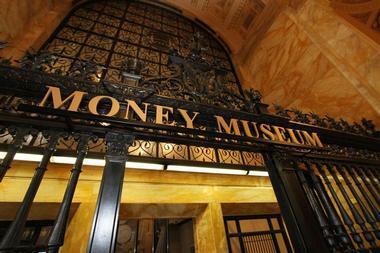 Located at the Cleveland Federal Reserve Bank, the Cleveland Learning Center and Money Museum will educate children about money, saving and the economy in a fun and engaging way. The museum is open to the public from Monday to Thursday from 9.30am to 2.30pm and entrance is free. Children can have fun as they move from one interactive exhibit to the next, and will learn about trading at Barter Island, find out how to recognize counterfeit notes and even have the chance to make their own currency. You can take a virtual tour of the Learning Center on their website to see what to expect during your visit. The Cleveland Police Museum is an interesting attraction for older children and their parents, who will come away from their tour with a better understanding of how our police force has changed over the last century. There are several interesting exhibits to explore including the K-9 Unit exhibit and exhibits celebrating the Mounted Unit and the Motorcycle Unit. You will also be able to see how the famous Murphy Call Box enabled the police to stay in contact long before the advent of the cell phone. In addition you can learn about the infamous Torso Murders of the 1930’s and see some of the actual gruesome death masks. You can instill a life-long love of books and reading in your young children by bringing them along to make use of the excellent facilities on offer at the Cleveland Public Library. Younger children can have fun at the children’s ArtLab, which offers regular Story Time sessions and fun workshops and activities for young children and their care-givers – try Bouncing Babies (for birth to 18 months), Wee Read and Play (18mths to 3 years) and Super Sleuth Readers (for pre-schoolers up to 5 years of age). Older children can find and print out information to help them with homework or projects and the library also offers an on-line e-book lending service for children. 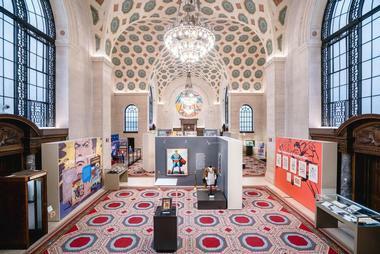 Cleveland Public Library has branches dotted all over the city. Find your closest branch on the website. 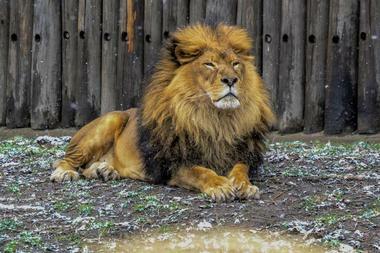 You will find the Cleveland Metroparks Zoo hard to beat for a fun-filled family adventure. The wonderful Elephant Crossing attraction is one of the first you will see as you enter the zoo and it perfectly sets the scene for the rest of your fun day. When little legs get a bit tired from walking around you can take a break to watch a movie at the 4-D Theater, or hop aboard the Boomerang Line train to be transported through the zoo’s Australia Adventure exhibit. You can also choose to tour the entire zoo on the free tram which is suitable for strollers. A few of the highlights that both adults and children will enjoy include the Rainforest, the Primate, Cat and Aquatics exhibit and the Asian Highlands where you will see rare snow leopards and red pandas. At the impressive Cleveland Botanical Garden children can have hours of outdoor fun while they are learning about all things botanical. One of the most interesting exhibits for families has to be the Eleanor Armstrong Smith Glasshouse which showcases some of the strangest-looking plants which thrive in desert and rainforest habitats as well as hundreds of butterflies, birds and reptiles. The Hershey Children’s Garden is a great place for younger children to indulge in nature play as they make mud pies, listen to stories, search for frogs and lizards in the pond or admire the hard-working honey bees in their hive. Special fun activities are presented in the Children’s Garden each day at 11am Tuesday to Friday and at 1pm on Saturday and Sunday. 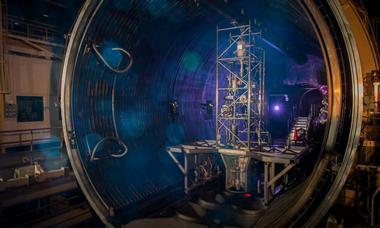 If you have a budding astronaut, scientist or space engineer in your family you can arrange to take them on a fascinating tour of the Glenn Research Center, which offers public tours once a month from April through October. You will need to book your tour well in advance as these very popular tours are often sold out. Your 45 minute tour of the research center combines fun and education and will take you to selected non-classified areas of the center to see how the scientists and engineers develop and use various aeronautics to continue the amazing NASA space programs. Please note that these tours are only available to American citizens and green-card holders with valid ID. The Cleveland Lakefront Nature Preserve covers over 88 acres of what was once a lake-side dumping ground for solid waste. Amazingly, this unsightly dump site has blossomed to become an urban nature preserve alongside the Port of Cleveland, where you can bring the children to enjoy some outdoor fun in the sun. 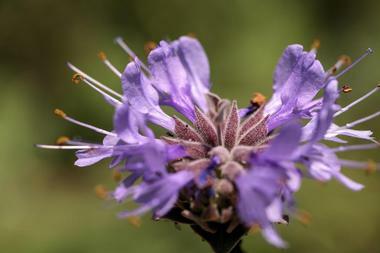 The preserve is home to three hiking trails which wind through a good mix of wildlife habitats including forests, grasslands, meadows and wetlands which attract a good mix of butterflies, birds, reptiles and small animals. It is a great place for children to enjoy nature, learn about bird-watching and get some outdoor exercise. Entrance is free. Most children will agree that there are few family outings that can beat a day of fun on a sunny beach. 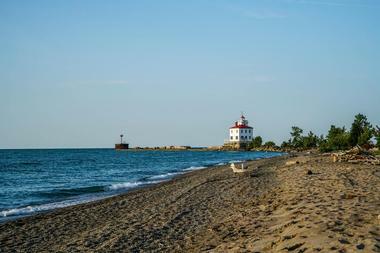 The Headlands Beach State Park is located just 27 miles from Cleveland and offers over a mile of natural sandy beach along the shore of Lake Erie for families to enjoy. The beach is perfect for sunbathing, swimming, boating and beachcombing and the young visitors can enjoy building great sand castles. You are welcome to bring along a picnic or barbecue – there is a scenic picnic area with tables and grills. If you enjoy fishing and have an Ohio fishing license you can cast a line and catch your dinner. The park also offers two trails for walking/hiking. The Fairport Harbor Lakefront Park is another great destination for a family day of fun on the beach. 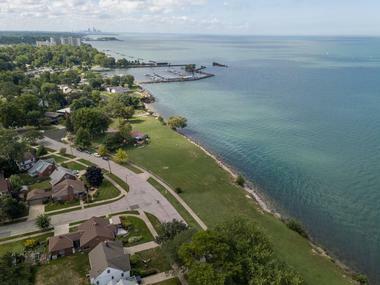 The park covers over 21 acres along the shores of Lake Erie and has many convenient facilities to ensure a great family day out. Although most people come to the park mainly to enjoy swimming and sunbathing, there is also canoe/kayak access, a playground for the children and a volleyball court for teens. The park has a pleasant picnic area with a shelter, tables and grills. If you have a four-legged family member you will be pleased to know that dogs are allowed at the park and have a designated swim area. 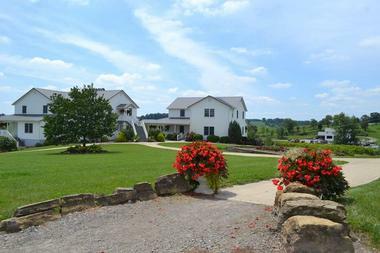 Located in the heart of Amish Country, the Farm at Walnut Creek offers the whole family an enjoyable and educational day out. Children can learn about everyday life on an Amish farm, where the pace of live is slower and there are fewer distractions. The farm is home to hundreds of animals, from domesticated farm animals to some really exotic creatures like giraffe, kangaroos and llamas. Instead of just viewing the animals from a distance you can make your way around the farm by horse-drawn carriage and get the chance to feed many of the animals. Since this is a working farm you will also see a various seasonal farming chores such as plowing, thrashing and harvesting underway. Visitors are welcome to bring along a picnic, visit the Amish homestead and take plenty of photos. 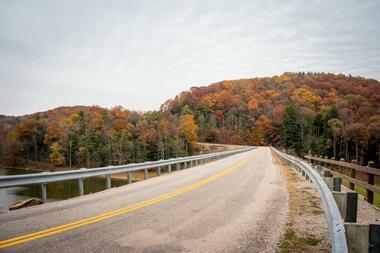 Located in Ashville County, the sprawling Mohican State Park covers over 1,110 acres of beautiful wilderness which offers unlimited activities for the whole family. Day visitors can explore more than 13 miles of hiking trails, try their luck at fishing, enjoy bird watching or even set off by horseback along the equestrian trails. 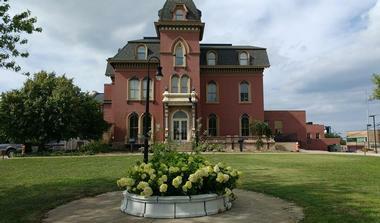 There are good facilities for picnicking and an interesting Nature Center. If your family is into camping you will find a great campground offering both primitive and electric camp sites, flush toilets, showers and a campground pool – bring along your tent or RV and enjoy a memorable camping holiday surrounded by outstanding scenery. The park also offers cozy winter accommodation in the lodge or cottages. 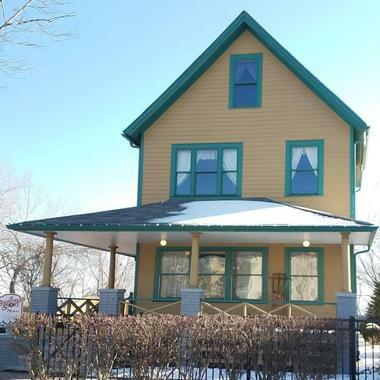 If your family is familiar with the popular family comedy A Christmas Story, you should certainly consider bringing them to see the original Christmas Story House and Museum in Cleveland. The house has been fully restored and children will be able to see the original costumes, props and other memorabilia from the movie. If you are planning to visit it would be a great idea to watch the movie again before you come to freshen-up everyone’s memory. After you have toured the house (which is open daily, seven days a week) you are invited to visit the museum across the road where you can buy great souvenirs to take back home with you. A new spot in Cleveland’s Detroit-Shoreway neighborhood on the city’s west side along Lake Erie, Banter is a sleek modern artsy bar and restaurant with two distinct parts: first, a narrow space with a few tables on one side and a long bar on the other and second, a beer and wine retail store with more than 450 craft beers and ciders from all over the country. 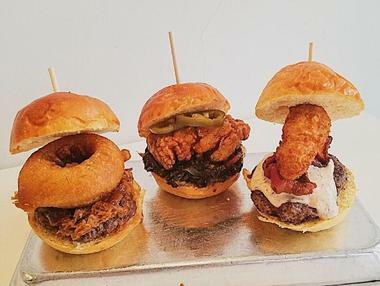 The entire menu in the restaurant is focused on the Quebec comfort food poutine and Cleveland artisanal sausages, with ten different kinds of each. The poutine is elevated to a gourmet level and includes dishes such as rabbit pot pie and all sorts of other ingredients besides the traditional fried potatoes, cheese, and sauce. When you combine them, you get winners such as the Polish Big Boy, a massive 12-pound sandwich with house-made kielbasa, a pile of fries, slaw, and secret poutine sauce. 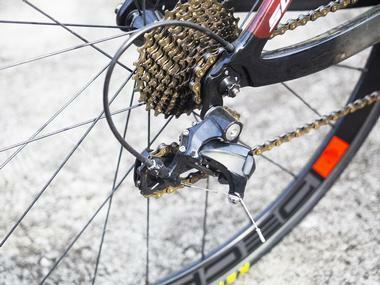 The Emerald Necklace Bike Trail will appeal to sporty families with older children. The trail covers over 70 miles of mixed-surface trails through an area of great beauty where you will always find something to catch your attention. Of course you can choose which section of the trail you would like to tackle depending on your children’s ages and fitness levels. Even a fairly short ride through the scenic Metropark cityscapes makes for a very pleasant outing and there are plenty of places to stop and have a break or a picnic. Since part of the trails will include public roads it would be a good idea to avoid these areas if you are riding with children. 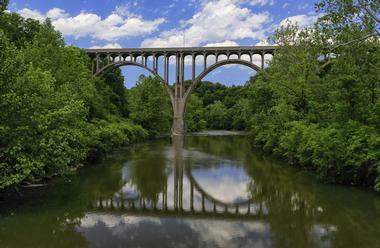 The Emerald Necklace Trail, Cuyahoga County, Ohio. There is nothing quite like a delicious ice cream to put a smile on a child’s face and in Cleveland, Mitchell’s Ice Cream has been delighting both children and adults for almost 20 years. 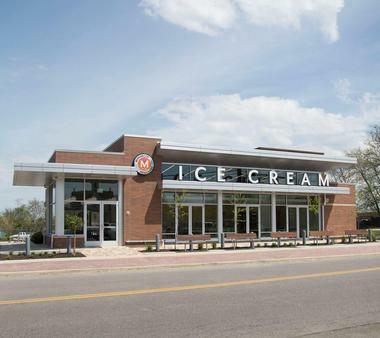 The company hand-makes all their delightful ice creams in small batches at their flagship Ohio City kitchen using the best quality local produce wherever possible. The best way to learn about Mitchell’s is to go on a tour of the kitchen where you will get to see the ice cream being made, get to taste several delicious ingredients and receive a free scoop certificate to use at any time. Mitchells also make delicious malts, sundaes, shakes, floats and organic fruit smoothies. Besides the flagship store there are several other branches in Cleveland. The ever-popular West Side Market has been supplying the people of Cleveland with farm-fresh produce since November 1912, making it the oldest public market in the city. As you make your way through the stalls your nose will sniff out just about every type of food you can imagine, all under one roof. The list of vendors is impressive and you could easily stock up on everything you need for a week of nourishing and wholesome family meals as well as all the naughty stuff like cakes, pastries and other treats. There are dozens of stalls selling delicious ready-prepared foods to eat as you go – be sure to bring along a big appetite.